Swifts are a sign of summer. They arrive from Africa, normally in late April/early May and leave again in early August. Landmark’s first sightings this year were near Avonmouth and in the Chew Valley on 4 and 5 May respectively. This brief summary fails to describe a remarkable bird, and the very tangible benefits that it brings to ecosystem and economic health and wellbeing. Many developers are apprehensive of allowing swifts to colonise sites because they are very vocal for the short time that they are around, and leave droppings around nest sites. Balanced against these ‘problems’ are very real benefits, however. In terms, for example, of pest control, nutrient cycling, and agricultural and horticultural services, the swift probably eats more small insects and spiders than any other British bird. Capturing these benefits within development is normally simple and cost effective, and can add to the BREEAM sustainable building rating for new buildings. Incorporation of features such as swift nest boxes into residential development schemes not only benefits the birds, but adds an easy win to the BREEAM assessment, especially in physically constrained urban sites, by enhancing site ecology. Swifts migrate to the UK to breed, nest and raise their chicks so, despite spending the remaining nine months of the year in Africa, their time here is of the upmost importance. Each bird completes a colossal 6,000 mile migration twice a year. Being on the wing is a way of life for these aerial acrobats, which feed, sleep and mate in flight, only coming to land when nesting. In a single swift’s lifetime it may fly some 1.3 million miles, at speeds exceeding 69 mph. A swift doesn’t land at all for the first 2-3 years of its life, only touching terra firma when it returns to the area of its birth, to find a mate and raise its own family. They start egg laying between mid-May and early July and lay a clutch of up to 3 eggs. Within 5-8 weeks of hatching the chicks will fledge and take to the wing for the first time. Swifts are found all over the UK in the summer. Bristol’s swifts first converge over Chew Valley and Blagdon Lakes, feeding on the newly hatched flies that have emerged from the water. After a few days feeding and regaining their strength following their long migration they start to return to their traditional nesting locations throughout the region. Despite the many risks encountered during the long flights between sub Saharan Africa and Europe, the key threat to the species is caused much closer to the swifts’ home breeding territory in the UK, by loss of nest sites to building renovation, re-roofing or demolition. Like many other species of bird, swift numbers have declined sharply across the UK in recent years, with numbers falling by 38% since 1995, putting the species on the Birds of Conservation Concern Amber List. Following this trend, swift numbers in Bristol have also steadily declined for over 25 years, with by far the most significant cause being the lack of suitable nest sites. Swifts are almost entirely dependent on buildings for their nesting sites, squeezing into small nooks and crannies, generally under the roof tiles or soffits. Building refurbishment tends to seal up such spaces, without recognition of the importance of these sites for just three months each year, and the nest sites are lost forever. New build properties are likewise carefully sealed for good insulation. Swifts are faithful to a nest site and return year after year to the same site, often throughout their lives. Some colonies are very old and have been used by successive swift generations for tens if not, hundreds of years. This makes them very vulnerable to disturbance and, if a colony is destroyed, it is normally unlikely to find a substitute nesting site and the entire breeding season will be lost. With simple steps it is easy to make space for swifts when repairing or replacing roofs, ensuring that holes and eaves that they use for nesting are maintained and work does not take place during the short breeding season. Repair works and new build projects can equally aid swift conservation by incorporating nest boxes or nest bricks as part of the build programme. A nest box ideally should be at sited least 5 metres above the ground. The nest box can be fitted to any aspect, although precautions are needed to avoid the effect of the mid-day sun (such as by painting the box it a light colour) if it is sited to face south. Most importantly, the flight path into the nest box should be free from obstacles such as nearby trees or wires – if a swift is forced to land on the ground it cannot easily regain flight and is at high risk of predation. For the enthusiast, it is even possible to encourage swifts to use new boxes by playing swift attraction calls from a sound system next to the box. The most effective time to do this is in mornings and evenings on calm, dry days from May to July. The benefits of swift song can also be enjoyed by human listeners! 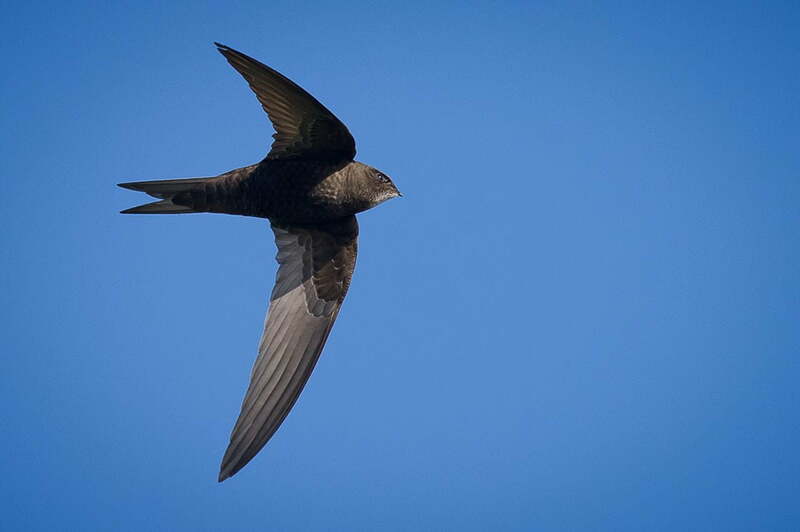 For more information on the swift population in Bristol and how to encourage them to nest in your property visit www.bristolswifts.co.uk.